Who knew pearls grew outside of the ocean? Plant one in your jewelry box and watch the beauty pay off quickly! This blossoming ring is meant to be plucked and present at every special occasion. 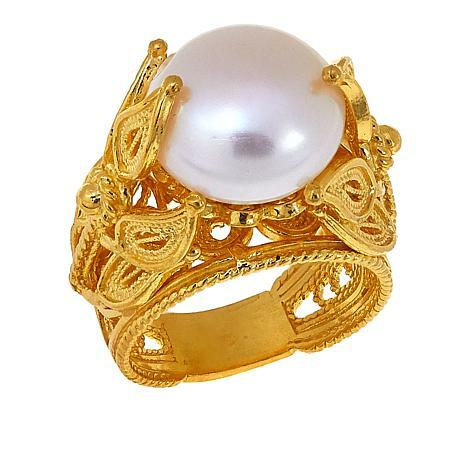 This ring sits up high showcasing the lustrous pearl which makes it very elegant and regal. Exactly what I expected, thanks. 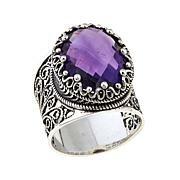 This ring stands out as one of the most beautifully crafted ring I have ever bought from HSN. It looks like something out of a museum. I ordered up one size so it would comfortably fit my middle finger. The fit and feel is perfect and easy to wear on a daily basis. The pearl is luxurious and eye catching with its size and luster. The gold looks like 24 or 22 karat gold. 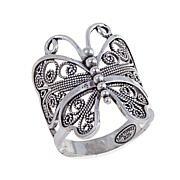 You will feel special when you wear this ring! Such intricate detail and the 24kt gold color is accurate. This truly looks like a museum piece and I couldn't be happier with my purchase. I didn't need to size up, plus the fit is surprisingly comfortable and doesn't spin on the finger. An excellent purchase for yourself or as a gift! 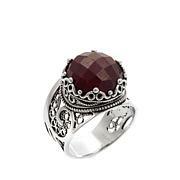 Ring for a Turkish Princess! I purchased the goldtone. 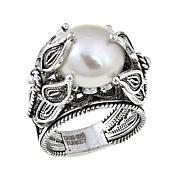 The detailing of this ring is very intricate and appears handcrafted; it hugs the glowing, large pearl as if it was a lotus flower. I wear it on my middle finger as it does make an eye-catching statement. Size one size up for your ring finger and two sizes up for your middle or index finger. You will need no other ring on your hand but this. It is stunning, lavish and expensive in appearance. So very pleased! Thanks, Ottoman & HSN! The pearl is white and luminous. Sits up high on your finger. This is not your everyday ring. I do believe it would catch on things. Nonetheless, the ring is gorgeous! !Will wear it proudly!